Today I was not supposed to be spending hours researching the best fats to cook with. But my plans to be productive were altered when I was stumped by a recipe. I'm working on a new muffin recipe for the market. I am going to have Double Yum (Bran) Muffins in less than a month. So I'm starting to work up a recipe. This usually begins by me selecting a recipe after searching for a lengthy time period. Then I change it so much it becomes more my recipe than anyone elses. So this recipe is a "6 week bran muffin" (I will not have the batter around for 6 weeks:). Because I do so much baking it will be handy to have a batter that is good for longer than a week. So my recipe calls for shortening. Normally I would say no way and switch out for canola oil- my choice for heart healthy cooking. But this is a longer sitting batter so maybe some shortening might help the texture of my muffin. I have some Spectrum organics "mechanically pressed organic palm oil" . 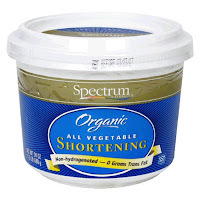 They call their product " a healthy, trans-fat free alternative to traditional shortening". Is it? As someone that has had some nutrition classes I know saturated fats are healthier than hydrogenated fats found in conventional shortening. I searched a good bit and the best I could find was Dr. Andrew Weil saying that palm oil contains vitamin E and is better than the evil palm kernal oil. And this product has 6g sat fat/ 1Tbsp. So in the quantity that I'm using it in my recipe each muffin will have 0.75g sat fat. That is really not much at all. 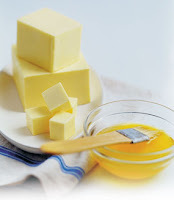 If you read my post on butter being not so bad for you then you understand my confusion over the choice of fats. In the nutrition realm it is agreed on that Trans fats are bad bad. I don't use any of those. Saturated fats are out of favor, but in baking they have their place. Butter is great for flavor and texture; too much of it is too many calories... weight gain... lots of health problems in general. And there is some conflicting research out there concerning what fats are the best for you. Chocolate has a high quantity of saturated fats and it is "good for you". There is a good bit of research showing that omega 3 fatty acids are good for our hearts, brains, ect. So I am choosing to use fats that are high in these: such as canola oil and flax seed. I'm using canola oil for the remainder of the fat in the recipe. I chose that oil because it has a good amount of omega 3 fatty acids. The spectrum website is slightly confusing on this matter. Of course they would like me to buy their walnut oil for my baking (considerately more expensive than my canola) but their is little difference in the omega 3 fatty acid content of walnut and canola oil. I can tell you this because of several hours I spent digging up the facts! The USDA database rules again!